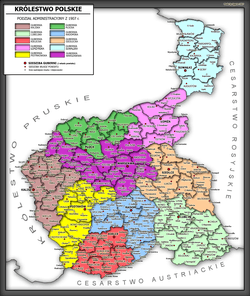 The territory of the Kingdom of Poland roughly corresponds to the Kalisz Region and the Lublin, Łódź, Masovian, Podlaskie and Holy Cross Voivodeships of Poland. 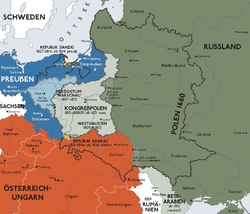 Following an 11-month military campaign, the Kingdom of Poland lost its semi-independence and was integrated much more closely with the Russian Empire. 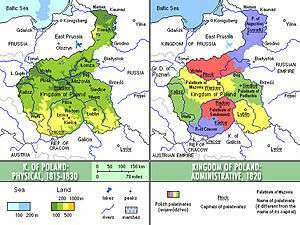 This was formalized through the issuing of the Organic Statute of the Kingdom of Poland by the Emperor in 1832, which abolished the constitution, army and legislative assembly. Over the next 30 years a series of measures bound Congress Poland ever more closely to Russia. In 1863 the January Uprising broke out, but lasted only two years before being crushed. As a direct result, any remaining separate status of the kingdom was removed and the political entity was directly incorporated into the Russian Empire. 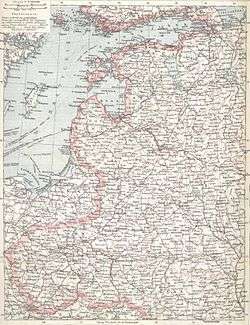 The unofficial name Privislinsky Krai (Russian: Привислинский Край), i.e., 'Vistula Land', replaced 'Kingdom of Poland' as the area's official name and the area became a namestnichestvo under the control of a namestnik until 1875, when it became a Guberniya. 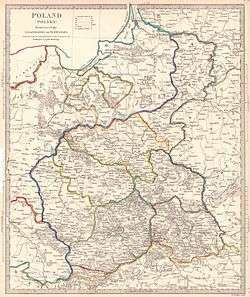 The office of "Namestnik" was introduced in Poland by the 1815 constitution of Congress Poland. The Viceroy was chosen by the King from among the noble citizens of the Russian Empire or the Kingdom of Poland. The Viceroy supervised the entire public administration and, in the monarch's absence, chaired the Council of State, as well as the Administrative Council. He could veto the councils' decisions; other than that, his decisions had to be countersigned by the appropriate government minister. The Viceroy exercised broad powers and could nominate candidates for most senior government posts (ministers, senators, judges of the High Tribunal, councilors of state, referendaries, bishops, and archbishops). He had no competence in the realms of finances and foreign policy; his military competence varied. The office of "namestnik" or Viceroy was never abolished; however, after the January 1863 Uprising it disappeared. The last namestnik was Friedrich Wilhelm Rembert von Berg, who served from 1863 to his death in 1874. No namestnik was named to replace him; however, the role of namestnik—viceroy of the former kingdom passed to the Governor-General of Warsaw—or, to be more specific, of the Warsaw Military District (Polish: Warszawski Okręg Wojskowy, Russian: Варшавский Военный Округ). 1 2 Nicolson, Harold George (2001). The Congress of Vienna: A Study in Allied Unity, 1812-1822. New York: Grove Press. p. 171. ISBN 0-8021-3744-X. 1 2 Palmer, Alan Warwick (1997). Twilight of the Habsburgs: The Life and Times of Emperor Francis Joseph. Boston: Atlantic Monthly Press. p. 7. ISBN 0-87113-665-1. ↑ Henderson, WO (1964). Castlereagh et l'Europe, w: Le Congrès de Vienne et l'Europe. Paris: Bruxelles. p. 60. 1 2 Miłosz, Czesław (1983). The history of Polish literature. Berkeley: University of California Press. p. 196. ISBN 0-520-04477-0. Retrieved 2008-04-10. 1 2 3 Nicolson, Harold George (2001). The Congress of Vienna: A Study in Allied Unity, 1812-1822. New York: Grove Press. pp. 179–180. ISBN 0-8021-3744-X. Retrieved 2008-04-10. ↑ "Kingdom of Poland" (in Russian). The Brockhaus and Efron Encyclopedia (1890–1906). Archived from the original on 2006-09-02. Retrieved 2006-07-27. 1 2 3 4 Ludwikowski, Rett R. (1996). Constitution-making in the region of former Soviet dominance. Durham, N.C.: Duke University Press. pp. 12–13. ISBN 0-8223-1802-4. 1 2 "Królestwa Polskiego" (in Polish). Encyklopedia PWN. Retrieved 2006-01-19. ↑ Janowski, Maciej; Przekop, Danuta (2004). Polish Liberal Thought Before 1918. Budapest: Central European University Press. p. 74. ISBN 963-9241-18-0. Retrieved 2008-04-10.